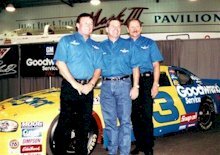 At a time when retro is in, Dale Earnhardt and Richard Childress Racing went back in time and returned to the 1980s for the 1999 Winston all-star event at Lowe's Motor Speedway in Charlotte. 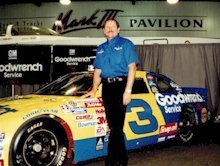 Earnhardt's car featured the nostalgic blue and yellow colors with Wrangler Jeans on the hood. It had been 11 years since Wrangler Jeans was associated with the No. 3 car of Richard Childress Racing. After winning the 1987 NASCAR Winston Cup championship together, Wrangler exited the sport and GM Goodwrench advanced from its associate sponsorship to RCR's primary sponsor. The entire gang came back together for this one race. For the driver who spent seven years driving a Wrangler car and another 12 years in a black GM Goodwrench car, the 1999 Winston was memorable. Dale Earnhardt gave a throwback effort in a throwback car but settled for fourth at The Winston on Saturday night. The event consisted of three segments - two 30-lap runs and a final 10-lap sprint - with a 10-minute break after the first segment for teams to make adjustments to their cars. Also part of the first intermission was a "Plinko" board that determined the number of spots that would be inverted for the second 30-lap run. Earnhardt, his Chevrolet Monte Carlo painted with the blue and yellow Wrangler Jeans scheme from the 80s, started the race from fifth position, dodged a couple of multi-car crashes, briefly took the lead from Jeff Gordon at one point, but due to an ill-handling car, finished fourth in the first segment. The biggest wreck of the segment, which was triggered close behind Earnhardt, took nearly half of the field out of contention, including many top contenders. After the first segment, the "Plinko" board was used to decide that the top six cars would invert their positions. Dale moved from 4th to 3rd because of this. Before the segment started, Dale's crew tightened the car up because it was loose in segment one. Earnhardt moved into second position at the start of the second segment. During laps 8 and 9 of the 30-lap segment, Dale swapped the lead a couple times with Terry Labonte. But his car again became loose, and he fell back to finish 6th in the second segment. Earnhardt's crew changed four tires and tightened the car up a bit more for the final 10-lap shootout (segment 3). The Intimidator tried to get to the front with his four fresh tires but couldn't get into position to become a contender. He moved up two spots at the start of the final dash but couldn't make any more progress, finishing almost one second back from the third-place car of Jeff Gordon. Terry Labonte passed Tony Stewart with four laps remaining to capture the win. Jeff Gordon finished third, followed by Earnhardt and Jeremy Mayfield in fifth. Earnhardt, the only three-time winner of The Winston, earned $30,000 for the fourth place finish.